Flight Engineer Serena Auñón-Chancellor practices on a computer the maneuvers she will use with Canadarm2 robotic arm to capture the U.S. Cygnus space freighter on Monday. The U.S. resupply ship will deliver approximately 7,400 pounds of food, fuel and supplies to the station two days later. Flight Engineer Serena Auñón-Chancellor will command the Canadarm2 robotic arm to capture Cygnus Monday at 5:20 a.m. Commander Alexander Gerst will back her up and monitor telemetry from the vehicle during its approach and rendezvous. The Progress 71 (71P) cargo craft from Russia is at the Baikonur Cosmodrome launch pad in Kazakhstan ready to blast off Friday at 1:14 p.m. EST. Prokopyev will be monitoring the Russian resupply ship when it arrives Sunday for an automated docking to the rear port of the Zvezda service module at 2:30 p.m. The International Space Station Program is testing the use of artificial intelligence today to contribute to mission success aboard the orbital laboratory. Meanwhile, the space residents from the U.S., Germany and Russia continued more human research and prepared for the upcoming U.S. and Russian space deliveries. CIMON, or Crew Interactive MObile CompanioN, is a free-flying robotic assistant based on artificial intelligence currently being tested on the station. The astronaut support device from ESA (European Space Agency) was powered up and commissioned today by the station commander inside the Columbus lab module. 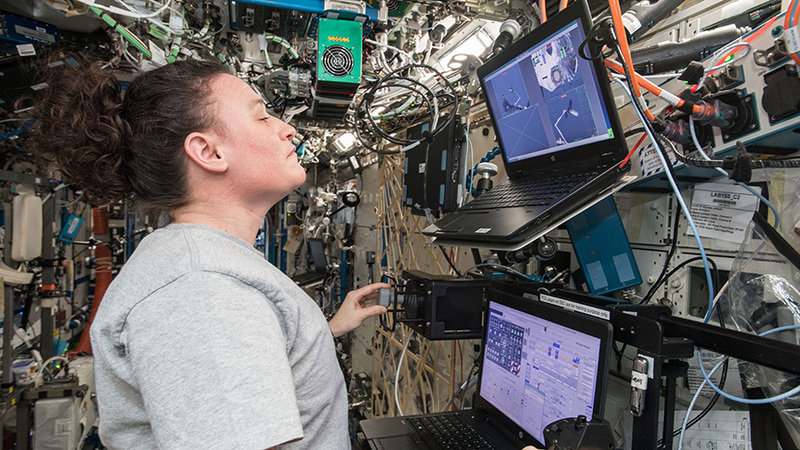 The CIMON technology seeks to demonstrate astronaut-robot interaction by answering crew questions, assisting with science experiments and navigating autonomously in the lab. Cosmonaut Sergey Prokopyev and fellow crewmates Gerst and Auñón-Chancellor started Thursday with ongoing eye checks. Gerst and Serena swapped roles as Crew Medical Officer scanning each other’s eyes including Prokopyev’s using an ultrasound device with guidance from a doctor on the ground. The data is downlinked to Earth real-time and helps scientists understand how microgravity affects astronaut vision as well as the components and shape of the eye.